It’s time for a new Runway Inspired Challenge. And we have a terrific guest designer; Teri Anderson from PaperCrafts Go-to Gals!! I must confess, despite the great patterns and colors, I was seriously stumped with this one! I drew the pattern that I wanted for the background on a 5.5″ x 4.25″ piece of white card stock and cut it apart. I then adhered each piece on a piece of clear sheet of same size (5.5″ x 4.25″), which in turn was adhered to the card base with foam tapes. For the butterfly, I stamped it with Memento Tuxedo Black ink and colored with Copic markers. I simply dabbed the tip of the marker randomly to create the splotchy look. The prize this week is a $25 gift card to Ellen Hutson! Make sure to stop by the Runway Inspired Challenge blog and see what the rest of the design team created! I would have never guessed that you were stumped on this one, Tasnim! The panels that you created is amazing! The butterfly and sentiment are just perfect! Tasnim, That is beautiful. Perfectly done. Truly amazing, Tasnim, truly amazing! LOVE your all white background. And, unless you happen to see this in the next couple of minutes, I am going to be so sad because you didn’t enter this in the Trendy Triangles challenge at MFW. It would have been perfect! PS, wonderfully splotchy butterfly, too. Wow! And, I mean Wow! 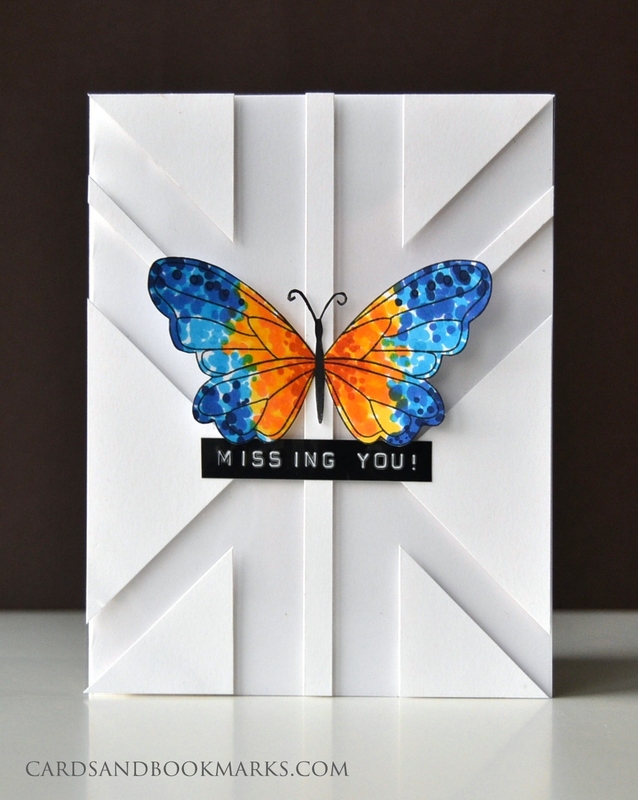 I love how you created the graphic pattern with your cardstock, and your butterfly is gorgeous! LOVE it, Tasnim!!! You? Stumped? It’s hard to imagine after seeing this beauty. Love that butterfly! Tasnim, you are just so talented. Who would think to do as you did, with the white cut out on the acetate then to dot the colours on the butterfly. I just wonder at the beauty of your talent, you clever wonderful woman. Ahh to have half your talent I would be happy. This has really WOWED me Tasnim! Truly AMAZING take on the inspiration photo!!! The technique you used to color the butterfly is fantastic. Reminds me of pointillism. This is fantastic! Love the white on white angles against that gorgeous butterfly! This card is amazing! I love the white on white and the amazingly colored butterfly! Perfection! Absolutely stunning … the triangles on the clear base – that awesome butterfly . You have captured the colours just beautifully . wow this is very stunning…love the effect of dotting the copics on the butterfly. I love the details on the butterfly! Oh I was SO close to doing the same dabbing with the copic marker!!!! And you got a dymo labeller!! Isn’t that thing the best tool?? Oh mannn you are amazing! WOW!! This is amazing! What a fabulous graphic look! Masterpiece! The background is just amazing and I love the splotchy technique! I see you got yourself a label maker too. This card ROCKED my socks off!! Wow–I am speechless, Tasnim. What an amazing card! I love the dots–it’s such a pretty effect.